People love their pets. The American Pets Product Association reports that pet owners spent $60.28 billion on their animal loved ones in 2015, and are projected to spend more than $62 billion in 2016. That's a lot of pet goodies! Pet owners are spending money on food, health care, housing, grooming, accessories and entertainment, providing ample opportunities for pet enthusiasts to profit through their own pet-related business. Here are six ideas you can start from home. One of the fastest ways to start working with pets is to start a pet sitting business. Summer and holidays are the ideal time to offer pet sitting as that’s when people travel the most. However, many people need sitters to care for their pets over the weekends while they go on short trips. Being pet sitter requires visiting people’s homes to feed and play with their pets. In some situations, you may actually stay at the client’s home, which means you can add house sitting duties (i.e. checking mail) to your pricing menu. 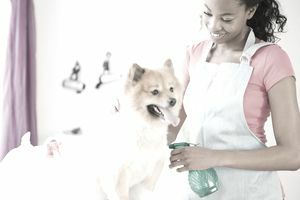 Pet sitters need to feel comfortable not only with animals, but with their owners and in entering other people's homes. Learn more about starting a pet sitting business. Pet grooming involves bathing, cutting and brushing hair, and clipping nails of dogs, and sometimes cats and other animals. While many owners need groomers for pet shows, some also use groomers to keep their pets clean, healthy, and looking good. Grooming requires training or experience working with a groomer. Many states require a license to operate a grooming business. You can contact your state’s occupational license agency for details. You can run a grooming business from your home or consider bringing your services to your clients through a mobile grooming business. Many animals don't enjoy being groomed, so you need to be comfortable handling animals that might squirm and even nip at you as you try to groom them. Learn more about starting a pet grooming business. Dogs are a man’s best friend, unless he’s ill-behaved. Dog trainers work to teach dogs appropriate behavior and owners how to keep their dogs behaving correctly. Dog trainers should have experience working with dogs and knowledge of dog behavior and how to modify it. Dogs aren’t the only animals that have behavior issues. I have a cat with no health issues that stopped eating. Her vet says it may be due to stress. Animals, like humans, have feelings and often react to situations with behaviors their owners don’t like (like peeing everywhere but the litter box). There is a growing marketing for animal communicators to help pets and families learn to live together in harmony. Learn more about starting a dog training business. Did I mention people love their pets? And because they do, they like to buy toys and accessories to entertain their pets and make them comfortable. With the growth of the Internet and online shopping, starting a home based pet supply business is easier than ever. You can sell your own creations (just make sure they’re pet tested), work with a wholesale supplier or promote products as an affiliate. Learn more on how to start a home based pet supply business. Pet owners spent nearly $14 billion on food alone in 2014. There is a growing market for healthy and organic foods and treats for pets. Food items are another type of business regulated by most states, so you’ll want to check out your state’s laws about producing and selling pet food. Check out this interview with Lisa Hennessy of Your Pet Chef on how she started her home based pet food business. Learn more about starting a pet food business. Pets are a member of the family and just like any other member, people like to have pictures for special occasions, holiday cards, and more. It helps to have experience with or knowledge of photography, as well as an ability to relate to different kinds of animals before starting a pet photography business. While you might have customers come to your home studio, many pet photographers travel to their customers' homes or other locations (i.e. parks), to take pictures. Sarah Sypniewski, author of Dog Photography, shares her story and tips of starting Bark Pet Photography. Learn more about starting a pet photography business.